Multiple gables, an arched picture window, and an L-shaped front porch add size and style to this charming home. An open floor plan enhances spaciousness in the common areas of this compact home, where a vaulted ceiling in the great room and a bay window and tray ceiling in the dining room create volume and elegance. A pass-thru from the kitchen to the great room adds to the plan's openness. The master bedroom boasts a cathedral ceiling and a trio of windows. The master bath features a dual sink vanity and a separate tub and shower. Two family bedrooms, one with a walk-in closet, share a hall bath. 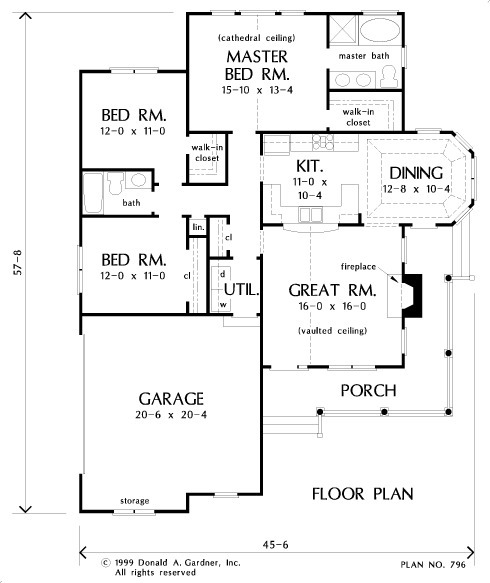 1st Floor: 1422 Sq. 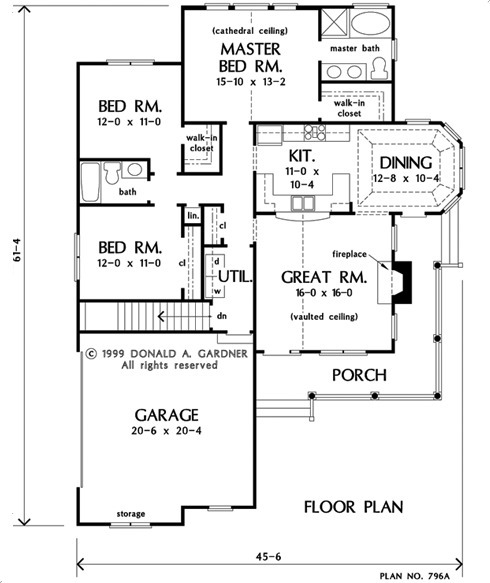 Ft.
House Dimensions: 45' 6" x 57' 8"
Dining Room (Tray): 12' 8" x 10' 4" x 10' 5"
Great Room (Vaulted): 16' 0" x 16' 0" x 18' 6"
Utility Room : 5' 10" x 6' 2" x 9' 0"
Garage : 20' 6" x 20' 4" x 0' 0"
Master Bedroom (Cathedral): 15' 10" x 13' 2" x 16' 6"
Porch - Front : 21' 10" x 5' 6" x 0' 0"